The MacDougalls are descended from Dugall, eldest son of Somerled of the Isles, progenitor of Clan Donald. The first record of the name is in 1230 when Duncan M'Kowele founded the Priory of Ardchattan in Argyllshire. Unfortunately for the MacDougalls, their chief supported Balliol against Robert the Bruce (through intermarriage with the Comyns) and was therefore deprived of his lands. 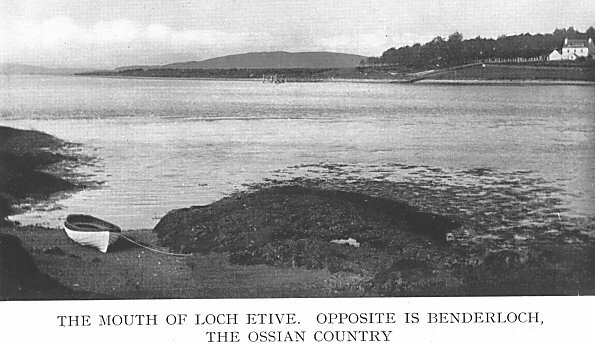 At the time the family controlled Lorn and Benderloch, the islands of Mull, Lismore, Coll and Tiree. In 1354 however some of these lands were restored when John MacDougall of Lorne married Robert the Bruce's granddaughter. Although they were descended from a common ancester the MacDougalls and MacDonalds feuded. The hostility that resulted was compounded during the 16th century when after an heiress had carried their lands to the Campbells via the Stewarts, MacDougall of Dunollie acknowledged Argyll as his feudal superior. The chiefship passed to the MacDougalls of Dunollie as the nearest male heir. The MacDougalls fought for Charles I during the Civil War and after, following the Stewart cause during the 1715 Rebellion. The chief's wife held Dunollie castle against the government troops while he was fighting at Sheriffmuir. The estate was confiscated but restored just prior to 1745 because of their loyalty to the Crown. The previous chief, Madam MacDougall of MacDougall and Dunollie, died on 5th May, 1990, aged 85 years. She has been succeeded by her niece, who has become the 31st hereditory chief of the clan. The new chief's daughter has inherited the ancient title of Maid of Lorn. No Highland clan has a history of more striking changes than that of the MacDougals. 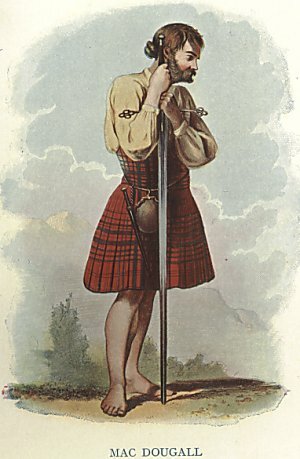 While the chiefs of the name were at one time sovereign princes in the Western Isles, their representative to-day is a private gentleman of moderate estate, and the race which once made treatie5 and fought battles with the kings of Scotland is now content to play a modest part as private citizens and loyal subjects of the British Empire. The early ancestor of the race was the mighty Somerled, Thane of Argyll and Lord of the Isles, in the middle of the twelfth century. Somerled was practically an independent sovereign, or, if he owed allegiance at all, it was to the King of Norway and not to the King of Scots. During the reign of Malcolm IV. he made several descents upon the Western Lowlands, and about the year 1157 made peace with that king upon the terms of an independent prince. It was the time when the possession of this north country still hung in the balance between the Norse and the Scottish races. David I. of Scotland, known to us by his descendant’s epigram as the " sair sanct for the croun," had laid far-sighted plans which were in the end to decide the issue in favour of the Scots. He had planted the threatened parts of his kingdom full with feudal knights, and in particular had settled the Stewarts at Renfrew for the purpose of blocking the waterway of the Clyde against the threatened Norse invasion. The Stewarts had carried the war into the enemy’s country, conquering Cowal and Bute, and being made Lords of these regions in consequence by Malcolm IV. By way of thanksgiving, it would appear, they had in 1163 founded the priory, now the Abbey of Paisley, when in the following year, with a view to turning the tables, Somerled sailed up the Clyde with a great fleet to attack them in their own territory. The attack failed. Somerled and his son, Colin, were slain, and another chapter in the great strife was ended. Somerled left two ultimately surviving sons. To the younger, Reginald, fell the Lordship of the Isles, held for centuries by his descendants, the MacDonalds; to the elder, Dugal, fell Somerled’s possessions on the mainland, and from him were descended the powerful Lords of Argyll and Lorne. Somerled’s wife was a daughter of Olaf, King of Man, and it is just possible that the present last remaining seat of the MacDougals, Dunolly, which is, of course, "the fort of Olaf," may take its name from this fact. 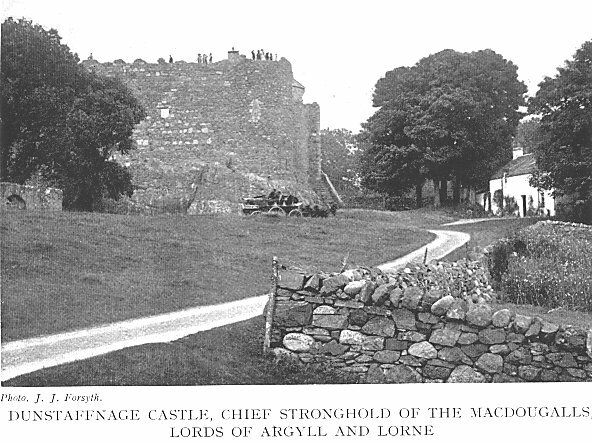 A century and a half after the days of Somerled the MacDougal Lords of Argyll and Lorne were probably the most powerful family in the West. Alastair or Alexander of Argyll had married the third daughter of John, the Red Comyn, and, after the tragic death of King Alexander III., was a stout supporter of the claims of his father-in-law to the throne of Scotland. The episode at the Church of the Minorites in Dumfries, when Robert the Bruce stabbed the Red Comyn, made the MacDougals most bitter enemies of that king. Again and again Alastair of Argyll and his son, John of Lorne, came within a stroke of achieving their purpose, and overthrowing and slaying the king. Shortly after Bruce’s first defeat at Methven, the little Royal army was wandering among the western mountains when, at Dalrigh near Tyndrum, it was suddenly attacked by John of Lorne with a powerful following, and forced to retreat. John Barbour, the poetic historian of the Bruce, tells how the king was guarding the rear of his retreating company when, as he passed through a narrow way between the river and the hill, three of the MacDougal clansmen made a special effort to capture him. One seized his bridle, but the king dealt him a stroke that severed his shoulder and arm. Another thrust his hand between the king’s foot and stirrup, hoping to drag him from the saddle; but the king, feeling the hand there, stood firmly up and struck his spur into the steed, so that it dashed forward and the man lost his footing. At that moment the third assailant leapt from the steep hillside upon the horse behind Bruce, and tried to garrotte the king. Bruce, however, bent suddenly forward, pitching this man over his head, and cleft his skull with his sword. Then he slew the man at his stirrup with a third stroke. Though he had slain his assailants, however, Bruce was not free, for one of them held the king’s plaid in his death grip, and it was only by undoing his brooch and letting the plaid go that Bruce got rid of his burden. This brooch, known as the brooch of Lorne, remains in possession of the MacDougals to the present day, and is the last tangible evidence of the ancient greatness of their house. More than once afterwards John of Lorne came within reach of slaying or capturing the king. On one of those memorable occasions he pursued him with a blood-hound. Bruce endeavoured to escape by dividing his forces again and again, but on each occasion the hound followed the party containing the king, and at last Bruce, left alone with his foster-brother, seemed on the point of being taken, when he remembered the device of wading a bowshot down a running stream, thus throwing the hound off the scent, and so escaped. But the king’s turn came at last. After his return from Rachryn, his victory at Loudon Hill, and his taking of Perth, he made a special incursion into the West to avenge the hurt, hatred, and cruelty he had suffered from John of Lorne. The latter waited his coming in the steep, narrow defile between Loch Awe and Loch Etive known as the Pass of Awe. It was a difficult place, so narrow that two men could not ride abreast, with Ben Cruachan towering above and the river pools boiling below. Here Lorne made an ambush, but he was out-generalled by the king. The latter sent the Lord of Douglas with Sir Alexander Fraser, William Wiseman, and Sir Andrew Grey, higher along the hillside, and the battle had not long joined when a shower of arrows from this outflanking party above took MacDougal’s forces in the rear. They were compelled to retreat, and, crossing the Bridge of Awe, were slain in large numbers at a spot still marked by their funeral cairns. Bruce then captured Dunstaffnage, the ancient Royal Scottish stronghold, which had been MacDougal’s chief seat, and proceeded to lay the country waste; whereupon Alastair of Argyll surrendered and was received into favour. But John of Lorne remained a rebel, and after Bannockburn, when Bruce sailed into the Western Isles, "None refused him obedience except only John of Lorne." Very soon afterwards, however, he was captured and imprisoned, first at Dunbarton and afterwards in Loch Leven Castle. After the death of Bruce, strangely enough, he was restored to liberty and his estates, and married a granddaughter of the king. When war broke out again in the days of Bruce’s son, and Edward Baliol overran the country, the MacDougals took the Baliol side. This was again the losing side, and in consequence the MacDougals lost a large part of their estates, which from that time passed more and more into the hands of the Campbells. The last MacDougal Lord of Lorne was Ewen. He left two heiresses, who became the wives of John Stewart of Invermeath, now Invermay, near Perth, and his brother Robert. Those Stewarts were descendants of Sir John Stewart of Bonkyl, who fell at the battle of Falkirk, and was a son of the High Steward of that time. Robert Stewart, the younger of the two, made a bargain with his brother John by which John obtained the whole Lordship of Lorne while Robert secured the entire family patrimony of Invermeath. From John Stewart and his MacDougal wife, accordingly descended all the Stewart Lords of Lorne, the Stewart Earls of Athol, and the Stewarts of Appin. The only part of the MacDougal Lordship of Lorne which did not pass to the Stewarts was Dunolly Castle, with its dependent lands, which belonged to the MacDougals of Dunolly, the next cadet branch, descended from Allan, son of John, brother of Ewen, last of the elder line, already mentioned; and upon these MacDougals of Dunolly the chiefship of the clan devolved. The MacDougals continued to hold these decreased possessions in more or less security till the time of the Civil Wars in 1645. Meanwhile the Campbells, whose first fortunes had been founded upon the downfall of the earlier house, had continued to grow in power steadily from century to century. At length, in 1645, the Campbell chief, now Marquess of Argyll, found himself at the head of the Government as the representative of the party of the Covenant in Scotland. For a few brilliant months his Royalist rival, the Marquess of Montrose, by a rapid succession of victories for the cause of Charles I., threatened to shake his power, but the battle of Philiphaugh practically ended his career and quenched the hopes of the Royalists in Scotland. Then Argyll, finding himself supreme, proceeded to turn the opportunity to account by destroying the last relics of greatness possessed by the families his own had supplanted. The army of the Covenant was sent first to destroy the MacDonald stronghold of Dunavertie in Kintyre, where three hundred of the garrison were slain. The Lamonts of Cowal were attacked, carried to Dunoon, and butchered bloodily to the number of some two hundred and thirty. And General Leslie was sent to attack and destroy the remaining MacDougal strongholds of Gylen on the Island of Kerrera, and of Dunolly on the northern horn of Oban Bay. This last commission was duly carried out, the castles were destroyed never to be restored, and the Brooch of Lorne, last sign of former MacDougal greatness, mysteriously disappeared. The MacDougals suffered again in 1715, when, as Sir Walter Scott puts it in a note to The Lord of the Isles, "their representative incurred the penalty of forfeiture for his accession to the insurrection of that period, thus losing the remains of his inheritance to replace upon the throne the descendants of those princes whose accession his ancestors had opposed at the expense of their feudal grandeur." At that time the strength of the clan is said to have been five hundred fighting men, though, according to President Forbes’ report, it was reduced thirty years later to two hundred. The chapter of the family history which followed is as romantic as anything in the memory of the Highlands. The head of the family fled to France, and his son would have been destitute had it not been for a member of the clan, at that time keeper of a public house in Dunbarton, who took the young chief into his house, and maintained and educated him till his sixteenth year. The lad proved clever and intelligent, and turned whatever advantages be possessed to good account. When the Jacobite rising of 1745 was afoot it was expected that Prince Charles Edward would land near Oban. Instead, as is well known, he disembarked at Lochnanuagh in Arisaig. Word of his landing was sent to MacDougal by Stewart of Appin, and MacDougal ordered his brother to have the clan ready to rise while he himself went to consult the Chamberlain of the Earl of Breadalbane. This individual threw cold water on the enterprise, pointing out that Charles had not kept his promise either as to his place of landing or in the matter of bringing forces to support his cause. MacDougal then proceeded to interview the Duke of Argyll at Rosneath. While awaiting the interview there he saw a horseman arrive at full gallop. Shortly afterwards the Duke, entering the apartment, map in hand, asked MacDougal to point out Lochnanuagh. MacDougal quickly perceived that the secret was known, and seized the opportunity of being the first to give details. By the Duke’s advice he took no part in the rising, and his reward was the restoration of the estate of Dunolly, which his father had lost. Such was the story told by a relation of the family at Dunstaffnage to Sir Walter Scott when he visited the neighbourhood in 1814. The MacDougal who had the estate restored lived to a great age, and it was his son who was in possession at the time of Scott’s visit. MacDougal had just then lost his eldest son, who had fallen fighting under Wellington in Spain. The second son was then a lieutenant in the Royal Navy, and it was to him at a later day that the Brooch of Lorne was restored with much ceremony by Campbell of Lochnell. On the occasion the Duke of Argyll himself was present, and everything in the way of courtesy was done to show that the ancient feud between the houses had at last come to an end. When Queen Victoria sailed along Loch Tay after enjoying the resplendent hospitality of Taymouth Castle in 1842, Captain MacDougal acted as the steersman of the Royal barge. It was pointed out to the Queen that he was wearing on his shoulder the famous Brooch of Lorne, and at Her Majesty’s request it was handed to her and examined with the utmost interest. On the occasion of the Scottish Historical Exhibition at Glasgow in 1911 the brooch was lent for exhibition, and a copy of it in gold, half the size of the original, was made and presented to Her Royal Highness the Duchess of Connaught, who accompanied the Duke on the occasion of his opening the Exhibition. Along with other interesting relics the Brooch of Lorne is still cherished by MacDougal in the quiet mansion-house behind the ruin of Dunolly Castle, which is now the seat of the chief. The principal cadet of the family was MacDougal of Rara, who is believed to have been represented later by MacDougal of Ardencaple. Other cadets are the families of Gallanach and Soroba, both close by Oban, the former having been represented by the late Sir James Patten MacDougal, K.C.B., deputy clerk register, and Keeper of the Records of Scotland, who assumed the name MacDougal in i8gi on succeeding his brother in possession of the Gallanach estate. Septs of Clan MacDougall: Conacher, Cowan, Dougall, Dowall, MacConacher, MacCoul, MacCulloch, MacDowall, MacDowell, MacDulothe, MacHowell, MacKichan, MacLucas, MacLugash, MacLulich.